You are a special guest at the 2nd Annual Moon on the Lagoon. FREE and open to all. Visit www.opera-matic.com for more information. Bring your friends, your family, and your flashlights for this special Humboldt Park lagoon twilight get-together. 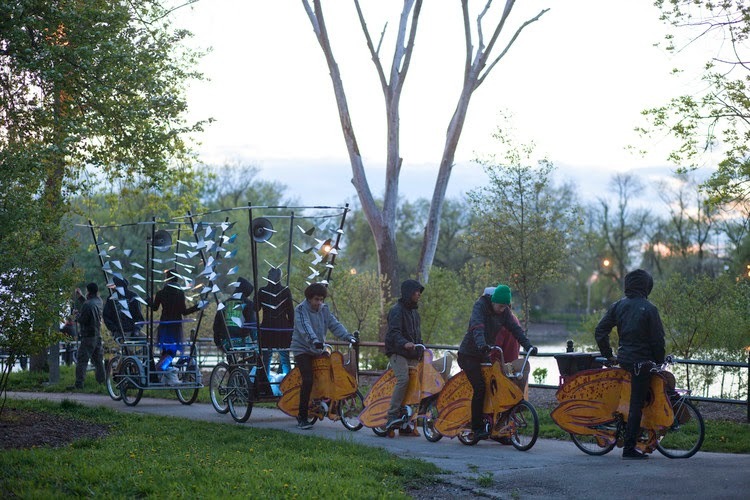 The Humboldt Park art group Opera-Matic, along with local community partners, has activated the paths around the Humboldt Park lagoon with orbits of light, movement, and sound. Spring is the time of year when birds move from south to north, ice melts, and we begin again. Flock together with us as we soothe ourselves quietly into spring, by circling the lagoon, the moon, and each other in song. The Light and Lullaby twilight tour is self-guided. All around the lagoon, twilight is happening in interesting ways, and the public is invited to join in lullaby sing-a-long stations, view the murmur of the lull-a-bikes gliding by, participate in flash-light flag corp dances, tour the lagoon’s lost light spots, and find community in the process. Come be part of our joyful night time gathering, powered by people and song.